Tuning in to Sound Quality is a free audio tutorial that is designed to help you improve the quality of your recordings. It features a series of example voice recordings that all exhibit problems of one type or another. By listening to these recordings, you will learn how to recognize the sound of a good quality voice recording, and what a poor recording sounds like. You'll also become proficient at identifying the presence of intruding environmental sounds that often ruin recordings. Tuning in to Sound Quality will give you the confident to produce your own recordings to a very high standard without the help of a professional audio engineer. It's a one-of-a-kind training tool that we hope you will take full advantage of. Simply follow the link below to create a free account with Enlightened Audio. This only takes 30 seconds. You can then access your copy from the "Free Downloads" area of your account. Already have an account with us? 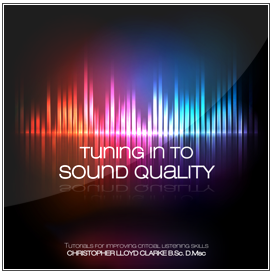 Your copy of Tuning in to Sound Quality is already waiting for you! Please log in and visit your Free Downloads. Looking for the solutions that accompany this tutorial? Please click here.